Luton chief Nathan Jones is looking forward to what will be a ‘wonderful occasion’ when his side play their final game in League Two this afternoon. 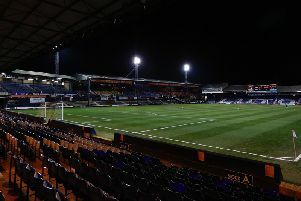 The Hatters head to Notts County already safe in the knowledge they have won promotion to League One and will finish second regardless of the result. There’s a slight element of relaxation, not in the way we prepare or anything, but we can prepare with zero pressure if you like. Their hosts are having to make do with a place in the play-offs, as victory could see them up to fourth, but despite nothing on the game for Town, they will be cheered on by a bumper away following. Jones said: “It’s going to be a wonderful occasion, 5,000 fans going to Notts County. “Let’s just not forget where we were last year. We were in wonderful place last year, in terms of the squad, the club, we were building and then we had the heartache (of losing to Blackpool in the play-offs) and that hurt. “There’s none of that now. It’s jubilation, it’s joy, it’s optimism, it’s everything. “We’ve achieved part one and we’re going to Notts County, the famous old football club and we’ll be taking 5,000 Luton fans, being promoted, to enjoy the occasion. “We won’t go there and relax in any kind of way as we want to win a football game. “We can really enjoy it though, we’ll go up early, we’ll make sure we prepare well and it’s going to be a wonderful week of preparation and an occasion. “You only enjoy it if you do well, but it’s a wonderful occasion, it is a time to enjoy it, but we want to do well. “We want to one, finish the season off right, but two, be respectful to everyone else in and around the play-offs as well and it’s for our own personal pride as well. Top scorer Danny Hylton was going to relish the occasion too, adding: “There’s no pressure on us, so we’ll go there and enjoy it. “It’ll be a big crowd, 5,000 Luton fans going, they’ll have a big crowd, a great game, a great occasion.